This post appeared in Vermont Watchdog on March 29, and is used with permission. Activists rally outside the Statehouse following a vote by the Vermont Senate to retire the Vermont Yankee nuclear plant in 2012. Since the plant’s closing, energy derived from natural gas has increased more than 5 percent. When Vermont Yankee closed at the end of 2014, it was largely with the understanding that renewable energy sources were going to take its place. According to data supplied by regional grid operator ISO New England, such has not been the case. Over the past two years, about 5 percent of New England’s electric use swapped from nuclear to natural gas. While nuclear production dropped from 34 percent to 29.5 percent, natural gas rose from 43.1 percent to 48.6 percent. The data from ISO New England’s Daily Generation by Fuel Type 2014 and 2015 was analyzed by the Institute for Energy Research, a group that tracks government regulation of global energy markets. Vermont Electric Cooperative CEO Christine Hallquist says the market is shifting towards natural gas. According to the U.S. Energy Information Agency for Vermont, in 2013 at least 9.7 trillion BTUs, or about 8 percent of all consumed energy, came from natural gas. Going forward, natural gas production could be coming to Vermont in a big way. Last year, the Vernon Planning Commission held a public meeting verifying they’ve been in contact with a developer about building a $750 million gas plant in town. That facility would link up to a not-yet-approved Kinder Morgan gas pipeline planned for southern New England. Hallquist said increased natural gas output is necessary because renewables can’t fill the gap left by Vermont Yankee’s exit. According to Hallquist, wind and solar have “low capacity factors” because they are dependent on the weather. The capacity factor is the average power generated divided by its peak capacity. If a 10-megawatt solar array averages output at 1.5 megawatts, its capacity factor is 15 percent. The capacity factor for wind is 30 percent. By comparison, gas and nuclear energy sources have a capacity factors of around 80 percent. 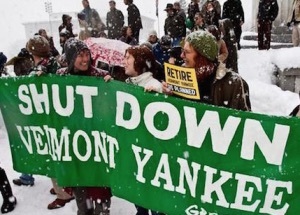 Opposition to Vermont Yankee gained momentum in 2010, when Gov. Peter Shumlin, then Senate president pro tempore, led an effort to prevent the Public Service Board from ruling on Vermont Yankee’s application to continue operation. While plant owner Louisiana-based Entergy already had federal approval to continue operation, the company decided to close Yankee, in part due to hostile political winds. Hardwick Electric Manager Mike Sullivan said he remembers Shumlin saying Vermont could close Yankee because the state didn’t need the power. Sullivan said he didn’t support Yankee’s closing because it provided low-cost power. According to Sullivan, natural gas for heating takes priority during Vermont’s many cold spells. This causes the otherwise very cheap energy — around 4 cents per kilowatt hour — to spike. Hallquist said the proposed Kinder Morgan pipeline would boost capacity during cold spells, when everyone uses gas for heat. Green Mountain Power spokesperson Dorothy Schnure said the Colchester-based utility’s power purchase contracts have been lengthy enough to be unaffected by the Yankee’s closure. However, Schnure and Sullivan both said that when their organizations buy market power, a portion of that is natural gas. Beth Parent, communications manager for Vermont Gas Systems, says natural gas offers heating for over 50,000 families, businesses and institutions in Franklin and Chittenden Counties. She added that 14 percent of Vermont families and businesses use natural gas as a primary heating source. 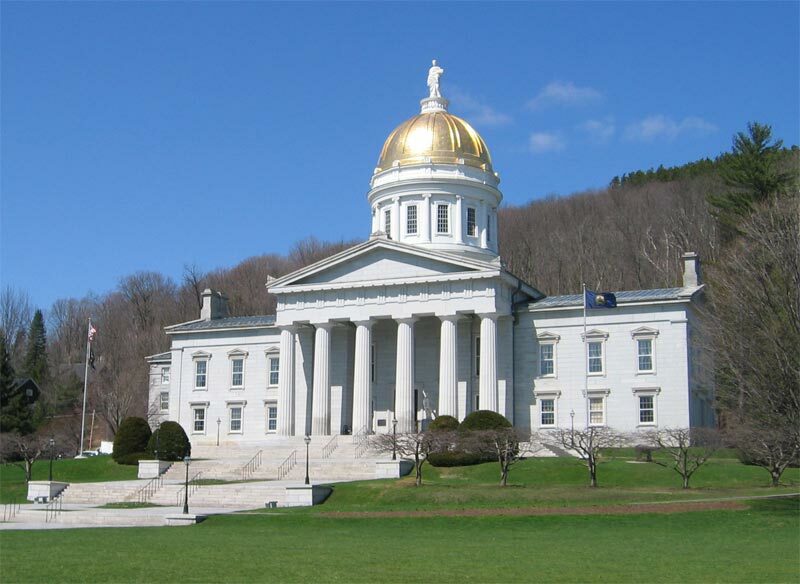 Sign-up for our Vermont Watchdog email list to receive the latest news and in-depth coverage. A Seton Hall 2005 graduate, Michael has been writing freelance articles for various publications in and around New York City, Seoul in South Korea, upstate NY and Vermont for ten years. He currently is a staff writer at the Hardwick Gazette keeping track of rising school budgets and other rural Vermont issues. He likes best to write about health, economics, and geopolitics generally looking for angles not seen in mainstream media. At home he's very busy looking after two little boys and during free time loves to watch Stanley Kubrick films off Netflix. I read with some concern a news report about a handful of Vermont and Massachusetts members of Congress pushing for more state control over U.S. nuclear plant decommissioning. As a retired nuclear engineer who sat at many state of Vermont public hearings regarding Vermont Yankee, the idea of giving states control over decommissioning fills me with dread. Vermont’s state energy officials routinely lose control of the microphone to shouting agitators. 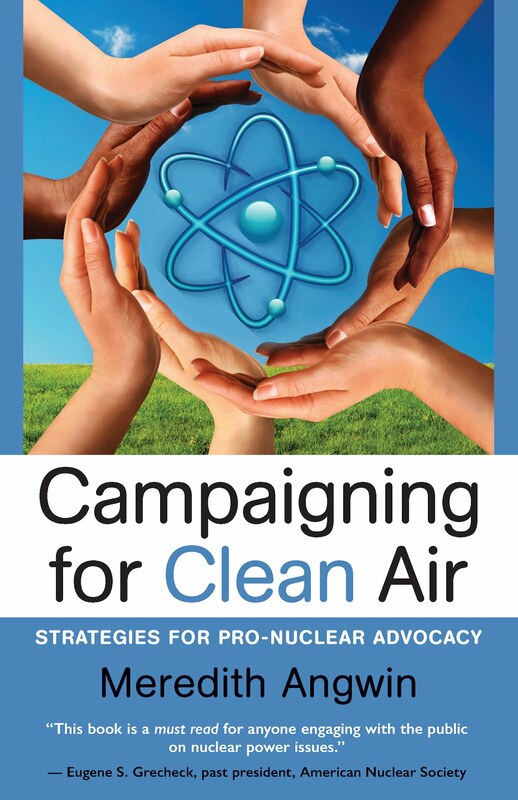 Many of the “experts” testifying about nuclear safety clearly lack knowledge in depth — a fact apparent to every nuclear professional in the audience, although not necessarily to the presiding state officials. Although at least two senior state scientists who routinely address these meetings are competent to testify, the general impression I get from state of Vermont officialdom is an anti-nuclear bias and a shaky grasp of the hard and applied science of safe nuclear power plant decommissioning. In short, I don’t want the state of Vermont, or any state for that matter, minding the store. I much prefer continued oversight by the U.S. Nuclear Regulatory Commission, which for decades has ensured the safe operation of the nation’s fleet of nuclear power plants. Also, unlike the NRC, Vermont is cash-strapped and forever seeking new funding from Vermont Yankee. In this environment, can we rest easy knowing that all of the state’s decisions would be driven solely by safety, and not by the desire for one more infusion of Vermont Yankee cash? I’m skeptical. January has had several guest posts at this blog. The most recent was Fear-mongering delays decomm, in June 2015. In order to understand January's guest post, readers need to know that Vermont and other states are lobbying for the NRC to "tighten its rule-making" for decommissioning, as described in this article by Mike Faher at VTDigger. State claims it could be left with big bills for Yankee Cleanup. The Faher article also appeared on the front page of my local newspaper, the Valley News. I personally wouldn't say that the state wants to "tighten the rule-making." I would say that the state wants to "get some money." The state wants, among other things, continued funding for emergency planning, even after the plant is shut down. They also want SAFSTOR to be allowed for only 10 years, not sixty, and other expensive changes about dry cask storage. These expensive changes would be funded by the plant, by the NRC increasing the decomm funding requirements. As January points out, the state of Vermont is perpetually strapped for cash. Last-minute budget deals in the statehouse supposedly balance the ever-expanding state budget. Losing Vermont Yankee funding for the Clean Energy Development Fund and for emergency planning--this undoubtedly hurt the state's financial situation. (Maybe Vermont should have thought of this earlier, when the governor was leading the chorus of "Shut It Down.") In my simplistic opinion, the state doesn't want oversight: it wants money. As January said: the idea of giving states control over decommissioning fills me with dread. I would like to share my research, and my feelings, about the deep oddness at the heart of American RTO markets. RTO (Regional Transmission Organization) markets are those in which electricity generators (power plants, etc) and electricity transmitters (transmission and distribution companies) are generally different companies. The different types of companies interact by participating in complex auction processes. 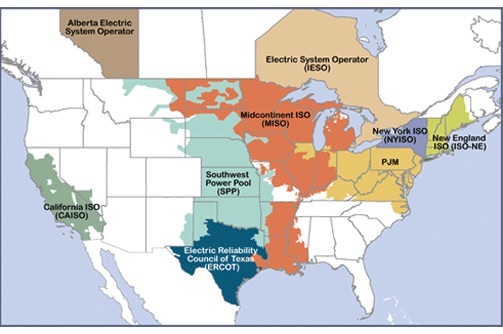 In contrast, non-RTO markets contain (mostly) vertically integrated utilities. In non-RTO areas, usually the same companies are in charge of both generation and distribution. I recently wrote an article for Nuclear Engineering International magazine "Pay for Performance on the U.S. Grid." This article shows how the supposedly cost-saving auctions have diverged farther and farther from anything resembling a free market. It also shows how the RTO markets basically punish reliable plants, and support unreliable plants. If gas plants had to subsist on the prices they received for energy, if gas plants main income was the money they receive for selling kWh on the grid, it would be much harder for gas plants to undercut nuclear pricing! I encourage you to look at the figures and read the article. My article has a reasonable title: Pay for Performance and the U.S. Grid. When I think about it, I refer to it as The Oddness at the Heart of RTO. Well, all those complicated auctions were supposed to prevent big nasty integrated electricity companies from ripping off consumers. (The companies would rip off consumers after they had "captured" their regulators, of course.) So, did it work? Did the the RTO auctions and free markets lower prices for electricity? I would argue that RTOs are not really free markets anyway (read my article), but in the meantime....did RTOs save money for the customers? Well, no. Or maybe yes, maybe no. Here's another chart, this one is part of a paper prepared for NESCOE, New England States Committee on Electricity, which "represents the collective perspective of the six New England governors in regional electricity matters." The paper was published in December, 2015. 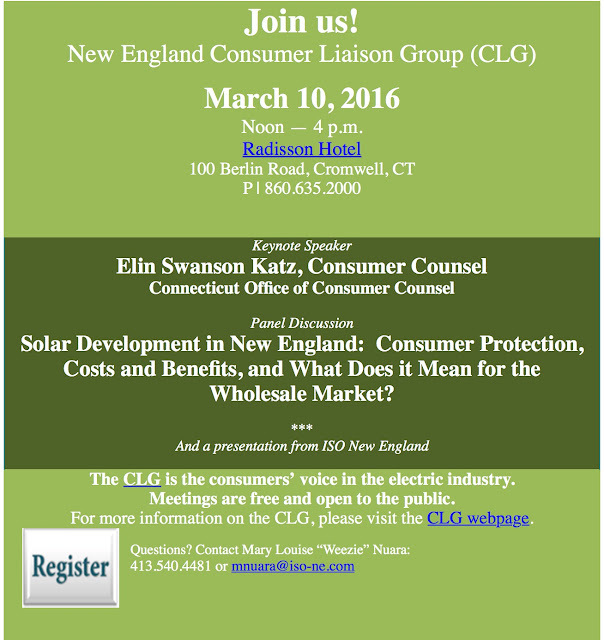 "Electric Restructuring in New England--A Look Back" prepared by Reishus Consulting LLC. This is a chart of retail prices over time. 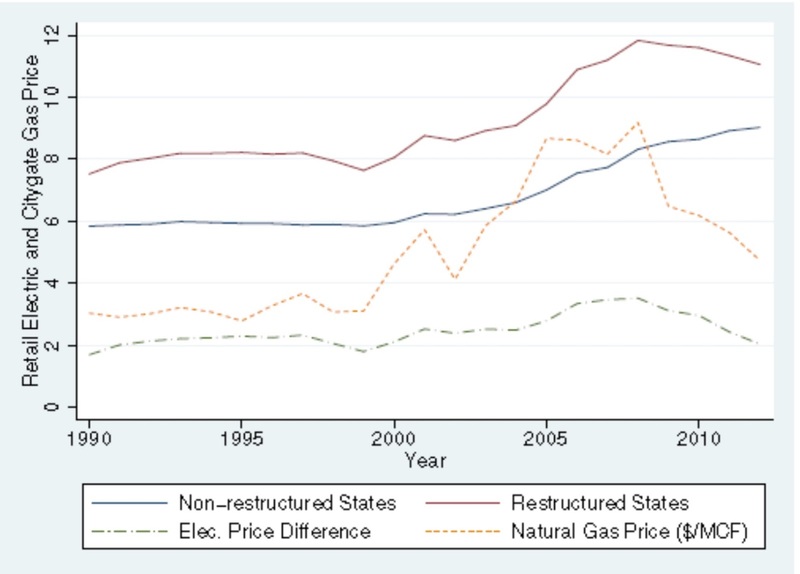 Note that the Restructured States (RTOs) have the highest prices for retail electricity. Yes. That's the red line at the top of the chart. 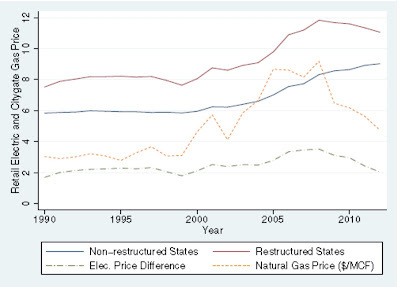 It must be added, however, that the Reishus Consulting paper also describes other studies that claim to find lowered retail electricity costs due to restructuring. I would say that the statement that "RTOs save money for consumers" is not currently proven, to my satisfaction, and it looks as if they don't. After all, that top cost line is the restructured (RTO) states. In short, RTOs may or may not save money for consumers. My opinion: probably they don't. Undoubtedly, however, RTOs make to make it harder for reliable plants to survive, and easier for unreliable plants. All the nuclear plants that are in danger of closing are in RTO areas. On March 4, long-time anti-nuclear activist Clay Turnbull was cited for trespassing at Vermont Yankee. 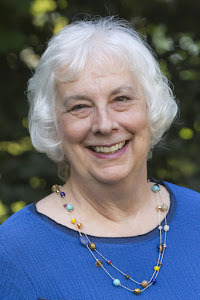 Turnbull is a trustee and staffer at the New England Coalition (NECN), a long-time antinuclear group that has been fighting Vermont Yankee for decades. According to a Mike Faher article on the incident, Vermont Yankee security summoned the sheriff's department because a "man with a camera was within the perimeter hiding along the inside fence line." Turnbull claims he was not hiding, but merely crouching down to take photos. Turnbull wanted to take pictures of the proposed dry cask storage area, to show it was more visible than Entergy claims. Turnbull also claims that he did not know he was on Vermont Yankee property, since he had not crossed a fence. Turnbull also asserts that he has been on the site numerous times, and is "quite familiar" with the site. Turnbull was not a lone wolf at the site. He was alone, but he had been sent to Vermont Yankee by his organization. In an article by Robert Audette at the Brattleboro Reformer, Ray Shadis of the New England Coalition said that he was unsatisfied with existing pictures of the proposed dry cask storage area. Shadis said: "Clay got some photos at about 200 feet, through the old switchyard, which we assume will be gone with decommissioning, showing plainly that what Dodson (of Entergy) said was fiction. I asked Clay to return to see if there were clear views from any other vantage points along the fence. Apparently Yankee now features multiple lines of fence." So, a man is sent by his organization to take pictures at Vermont Yankee. The man claims to be very familiar with the site, and also completely unaware that he is trespassing. Well, Vermont Yankee reacted at the time of the trespass. Spokesman Marty Cohn was quoted in the Faher article at VTDigger: Cohn said that Turnbull's actions put the plant into a high-security alert. By the nature of security and security alerts, Cohn could not elaborate much more on the plant's reaction to the trespasser. In some ways, this whole incident is just plain funny. In other ways, not so funny. These are grown men in an anti-nuclear organization. As part of their role in that organization, one of them tells the other to get better pictures. Their actions cause a security alert. This is not about a little boy trying to get down to the river to do some fishing. This is not about a casual trespass. This action was discussed and planned, within the organization. My suggestion is as follows. On the day that Turnbull is found guilty of trespass, even if he gets nothing but a reprimand---on that day, Entergy should sue the New England Coalition for the expenses caused by the security alert. Entergy shouldn't sue for punitive damages or anything like that. That would look mean. Entergy should just sue for compensatory damages for the extra expenses caused by the alert. At the same time, Entergy should ask for a restraining order against members of NECN approaching Entergy property. I mean, the people from NECN admit that there was an organizational plan, discussed between two members of the organization, to take these pictures. Turnbull admits to being very familiar with Vermont Yankee. Then he trespassed. In my opinion, Vermont Yankee has both the law and the facts on their side, and they should bring suit. NECN should absolutely pay the cost of the security alert. In the section above, I mention Ray Shadis and Clay Turnbull. Their names have appeared before in this blog. In a blog post a few days ago, I shared a quote from Ray Shadis, a quote that originally appeared in the Rutland Herald. In this quote, Shadis suggested that Entergy should buy a gravel pit across town from the plant, and store spent fuel underground at that gravel pit. Clay Turnbull has also appeared in this blog. In a post last year, Opponents Claim That Vermont Yankee is More Dangerous Than Ever, I quote Turnbull. 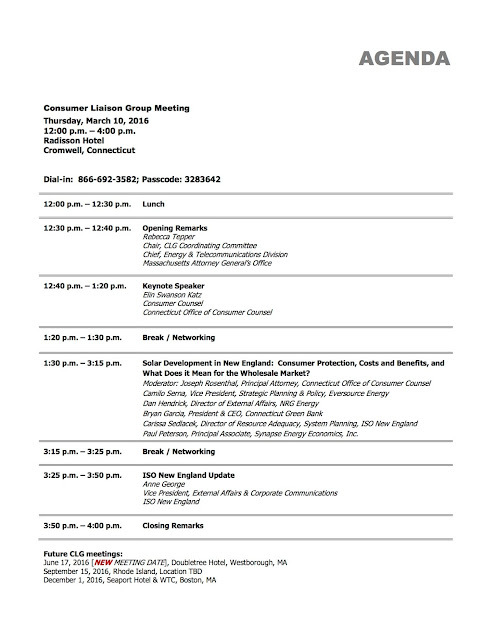 He had written that, although the NRC plans no further meetings in Brattleboro after February 2015, "Each time Entergy requests a licence amendment or exemption from regulations is an opportunity for the public to challenge that action with all parties under oath..."
Update: This post has been reprinted at The Energy Collective. It currently has five comments at that site. The Energy Collective usually has more comments than I receive on this blog. RENEWABLES: The Senate Committee on Natural Resources and Energy faces difficult decisions about siting and grid limitations for the state’s green-energy future. MONTPELIER – New siting rules from the Public Service Board – as well as new grid concerns – are dominating the discussion as the Senate Energy Committee prepares for another week of expert testimony. Representatives of Sierra Club Vermont, Vermonters for a Clean Environment, and Energize Vermont were set to give testimony this week even as senators try to understand important information from the last few days. Last Friday, Margaret Cheney, one of three members of the much-maligned Public Service Board, discussed draft net metering rules written to appease critics of the board’s siting policies. “We intend to make the process clearer and easier for municipalities and citizens alike,” she said. 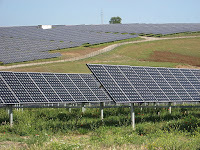 Net metering allows consumers to connect their own solar arrays to a public utility power grid. Whenever unused power gets transferred to the grid for use by others, owners of solar installations gain a reduction on their own energy bill. The net metering changes proposed by the PSB apply to systems up to 500 kilowatts. During testimony, Cheney suggested using price incentives and disincentives to encourage solar siting that respects municipalities. Preferred locations include gravel pits, quarries, sites next to the primary user or sites designated by the town. In Vermont, utilities pay about 20 cents per kilowatt-hour for power generated by net metering projects – high above the market price of about 5 cents per kilowatt-hour. State Sen. John Rodgers, D-Essex/Orleans, said the system is expensive. According to the proposed rule changes, net metering system owners would be penalized if projects aren’t sited favorably. They can be further penalized if their renewable energy credits, or RECs, are sold out of state. As Vermont generates more green energy, lawmakers have to figure out how it will be transmitted. Asa Hopkins, director of energy policy and planning for the Public Service Department, said big changes to the grid will be necessary if Vermont is to be 90 percent renewable by 2050, assuming all electricity comes from solar energy. Hopkins told Watchdog in a later exchange that Vermont’s 2015 Comprehensive Energy Plan does not foresee attaining the 90 percent renewable goal using solar alone. He also said storing energy is not possible with current battery technology. The proposed changes to Vermont’s energy system come as towns are pushing back against poorly sited solar and wind plants. Last week, the PSB made a nearly unprecedented move to reject a 2-megawatt solar project planned for Bennington. 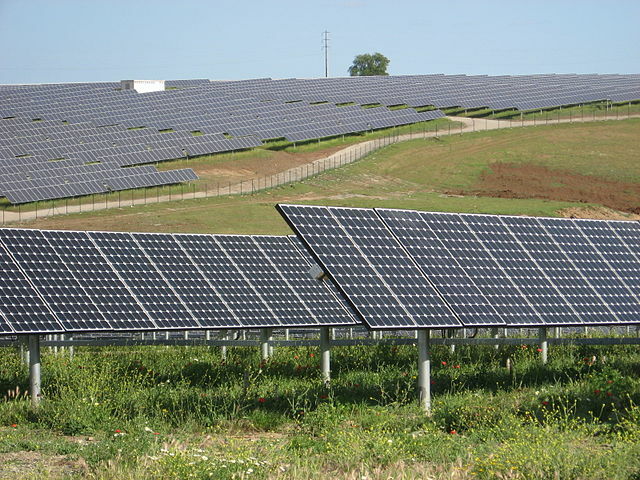 The board has been criticized for rubber-stamping solar and wind projects proposed by developers. Rodgers said he believed public pressure led to the PSB’s denial of a certificate of public good. State Sen. Christopher Bray, the Democratic chair of the Energy Committee, said rare denials by the PSB should not be interpreted as ignoring the public. Nevertheless, he acknowledged negative public perceptions of the board. “I have a sense from conversations with lots of folks that there’s a perception that unless a CPG is denied, the town has not been heard,” Bray said. Cheney said many projects reviewed by the PSB, including projects as large as 500 kilowatts, receive little public comment. Rodgers said while he hopes board members are respecting the wishes of towns, more needs to be done. Rodgers welcomed the boards new siting guidelines. Early in the session, Rodgers sponsored a bill to subject energy developers to Act 250, Vermont’s strict land use law. He said he wants criteria from Act 250 put into Section 248, the energy siting statute, to make it a more citizen-friendly system. CLARIFICATION: This story was updated at 4:53 p.m., Feb. 25 to clarify the statement by Asa Hopkins. The claim that the grid update would need to hold up to eight times more power assumes a scenario in which Vermont achieves its renewable goals using solar energy alone. This article appeared on February 23 at Vermont Watchdog, and is reposted by permission. Labels: Asa Hopkins, grid costs, Guest post, Michael Beilawski, Solar, Vermont Watchdog.